The Znojmo Catacombs are a series of subterranean passageways located beneath the city of Znojmo, in the Czech Republic. The underground tunnels were built to protect and shelter people in times of war, and inbuilt traps, such as inescapable pits and choke points, ensured no invaders would escape the catacombs alive. Although the passageways of this underground labyrinth (considered by some as one of the largest in Central Europe) have been commonly referred to as ‘catacombs’, it is in fact a misnomer, as catacombs are usually associated with the dead and burials. In the Znojmo Catacombs, however, there is no evidence at present that they were used for human burials. Instead, the Znojmo Catacombs were utilized as shelters during times of war. Znojmo is a historical city located in the South Moravian Region in the Czech Republic, 190 km (118 miles) to the southeast of the country’s capital, Prague. This city is well-known for many reasons, including its pickled cucumbers, wine, and the Battle of Znaim in 1809, during which the French under Napoleon Bonaparte defeated the Austrians under Archduke Charles. The Znojmo Catacombs are said to have been built during the Middle Ages, several hundred years before this battle took place. 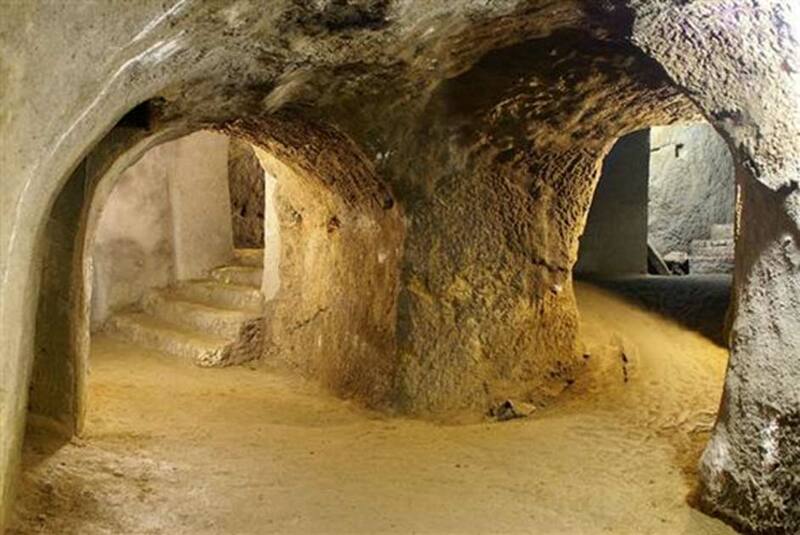 During the Medieval period, the buildings of the city, such as houses and palaces, had subterranean cellars. These cellars were used by the people chiefly for the storage of the wine this city is so famous for. Nevertheless, they were also used to store various agricultural produce, in particular food. During the 14 th and 15 th centuries, these individual cellars began to be connected, and little by little, the Znojmo Catacombs were formed. The Znojmo Catacombs are estimated to cover a distance of more than 30 km (18 miles), making it the one of the largest catacombs in Central Europe. This maze of tunnels, however, has not been mapped and measured completely yet, as there are parts that are currently completely flooded. In addition, only about 1.6 km (1 mile) of this labyrinth is open to the public, which may be accessed via the east side of the Slepici trh (meaning the ‘chicken market’). During times of war, the inhabitants of Znojmo are said to have used the catacombs as hiding places. 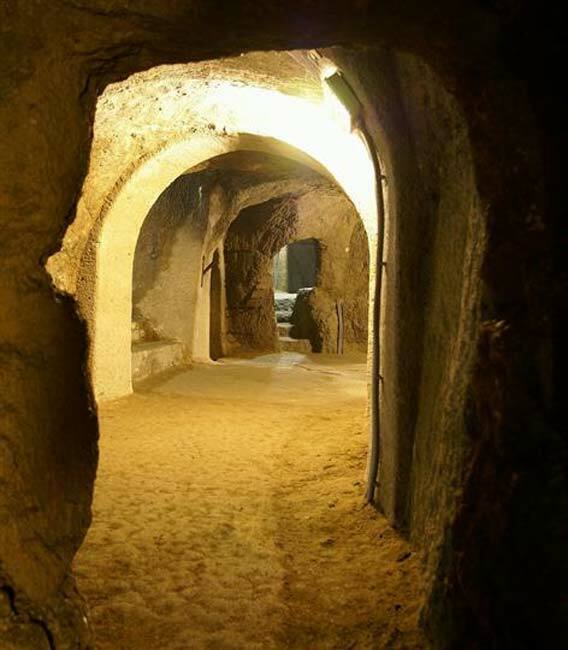 Water was available to those hiding in the catacombs, as ground layers that contained this precious resource was cut during the construction process. Wells were built in these areas to supply water to the inhabitants of the city. In addition, the catacombs were equipped with sewage and drainage systems to keep the place clean. As for ventilation, shafts leading to the chimneys and fireplaces in the buildings above provided air to the catacombs. Furthermore, tunnels leading out of the city were created in case the people of Znojmo needed to escape from the city. Whilst these designs provided much safety and comfort for the population of Znojmo during times of war, the catacombs also contained features that were meant to harm the invaders, should they manage to enter into them. Traps were installed in the passageways of the catacombs, and include slippery slides that ended in inescapable pits, narrow choke points, and trapdoors. Enemies who entered the catacombs were not meant to come out of them alive. It has also been pointed out that when an invading army entered the town, they would see that although it was empty, smoke would still rise out the chimneys of the buildings. The scene of this ghost town would have been eerie, and would probably have had a psychological effect on the enemy’s soldiers. Today, the catacombs (or rather, parts of it) are opened to the public, and, as mentioned earlier, could be entered via the ‘chicken market’. Little dioramas of goblins and ghouls have also been installed in these areas, perhaps in an effort to give it a more spooky and mystical feeling to the place.